When it comes to perfecting your chip shot, I see it all the time with players who come to me for golf lessons. Players don’t progress fast enough and they get discouraged. They stop golf lessons and play only sporadically, which doesn’t help their game. If you want to improve your game, and you want to do it quickly, perfecting your chip is among the easiest and fastest ways to do it. It’s also a great way to lower your golf handicap. But it takes work. The goal of a chip shot is to loft the ball over uneven ground and onto the green, where it can roll smoothly to the hole. Executed correctly, a good chip shot saves one to two strokes per hole. Executed incorrectly, however, it spells disaster. And while a chip shot isn’t hard to execute, some players still have problems hitting it correctly. Most of the time it’s just a matter of applying the right technique and practicing the chip shot until you’ve mastered it. You can chip with an 8-iron, a 9-iron, or a pitching wedge. Take a slightly open address position, with your weight forward. Position the ball closer to your back foot, hands in front of the ball, which “hoods” the clubface and gives you the loft of a 7 iron. And grip down on the club 4 or 5 inches for more control. Now, hinge your wrists slightly during the takeaway and strike down on the ball crisply. Your hands should lead through the hitting zone. For solid contact, return the hands and arms to where they were at address, which helps produce good ball-then-turf contact. 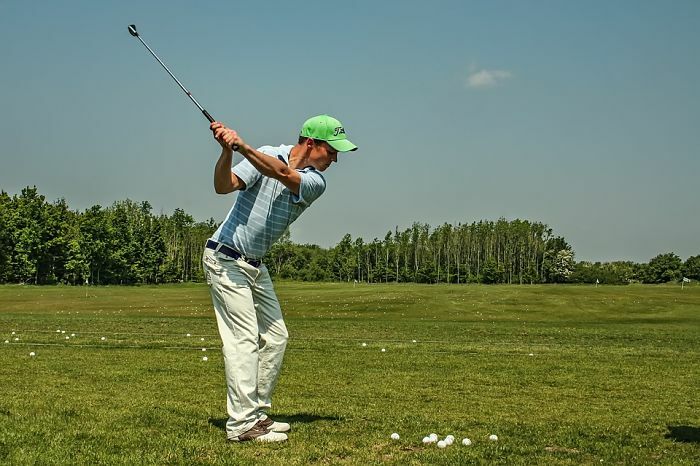 Keep the wrists firm through impact, and don’t turn the wrists over during follow-through. Stay relaxed and loose throughout the shot. That’s the basic shot. But what about chipping from the rough, you ask? The problem with chipping from the rough is the high grass. The longer the grass, the more it wraps itself around the club’s hosel, delofting the club on impact. What’s more, the grass trapped between the clubface and the ball reduces spin, causing the ball to roll more upon landing. 1. Set up as you normally would for a chip shot. 2. Move your hands down the club. 3. Grip the club firmer than usual. 4. Play the ball forward in your stance. 5. Hinge your wrists to steepen the angle of approach. 6. Shift the hands and the body slightly left. 7. Allow the clubhead to come through the ball. If it’s a long chip from the rough, remember to factor in more roll when it lands on the green. If the grass is really thick, you can play the shot like a greenside bunker shot. Open your stance and your clubface, creating loft. Then hit the ball. You’ll come out soft and stop quicker than usual. Instead of hitting down on the ball, hit it with a gentle rocking of the shoulders, like you were putting. This technique raises the club several inches off the ground in the backswing, and forces you to hit down on the ball slightly, chipping it into the air. Concentrate on maintaining the width of the gap between your elbows as you swing through, ensuring a pure arms-and-shoulders motion. Remember to take into consideration the slope of the green, just as you would if you were putting. The random ball drill is the simplest of all chipping drills. It’s also probably the best. Take several balls with you and your chipping club(s). Spread the balls around the green. Pick out as many different lies as you can. Create scenarios as much like actual play as possible. Practice chipping with the iron of choice, then move on to another club. Master chipping with one club before moving on to other clubs. To practice this chip from the rough shot, place a ball just outside the first cut of rough on the fringe of the green. The grass should be about one to one and one-half inches in length. Instead of hitting the ball, practice just sweeping the tips of the grass. Use a low sweeping motion employing just your arms and shoulders. After ten sweeps, move immediately to the ball and chip it using the same motion. Then move the ball back to higher grass and repeat the sequence. The key to accurate chipping is keeping the ball low so it runs like a putt when it hits the ground. Here’s a drill I use in my golf lessons designed to teach players to keep the ball low. Lay a club or bag horizontally across two baskets placed about three feet apart. Then, step back a few feet and try chipping under the obstacle toward the hole, using either a wedge, an 8-iron, or a 9-iron. Mastering the chip shot – outside of putting – improves your game faster than anything else. It chops unnecessary strokes off your golf handicap as well. But you must work at it. Set up a practice routine and follow it faithfully. Work on the drills discussed above and add some others for variety. Play games with your friends. Do everything you can to keep it interesting. You’ll quickly see improvement in your scores and your game. Jack Moorehouse is the author of the best-selling book “How To Break 80 And Shoot Like The Pros” He is NOT a golf pro, rather a working man that has helped thousands of golfers from all seven continents lower their handicap immediately. He has a free weekly newsletter with the latest golf tips, golf lessons and golf instruction.